What: Shares of network technology company Viavi Solutions Inc. (NASDAQ:VIAV) are up more than 16% at 1:25 p.m. ET on Feb. 3 following the release of the company's second-quarter financial results and announcing the appointment of a new CEO. So what: Viavi reported net income of $3.3 million on $232 million of revenue, after reporting a $13.6 million loss on $230 million in sales in the year-ago quarter. Earnings, adjusted for certain items, came in at $25 million, good for $0.11 per share in the quarter. Both revenue and adjusted earnings came in well above Wall Street analyst estimates, which were expected to come in at $220.4 million and $0.07 per share in the quarter. Viavi also announced that it had appointed Oleg Khaykin as president and CEO and that he would also join the board of directors. Khaykin is new to Viavi, but was CEO of International Rectifier for six-plus years before its acquisition in 2015 and spent a number of years in executive positions at technology companies before that. He will replace Chairman of the Board Richard Belluzzo, who has been acting as interim CEO since Aug. 2015. Belluzzo will remain chairman. Lumentum is scheduled to report its second-quarter earnings on Feb. 4, and so far it's been the better-performing stock and business since the spinoff. When it announced first-quarter earnings in November, management said that its stand-alone sales, general, and administrative costs were significantly lower as a stand-alone company than those allocated to it by Viavi and that its operating margin and earnings per share in the first quarter -- which included some overlap in the combined businesses -- would have been much higher if not for that joint reporting period. 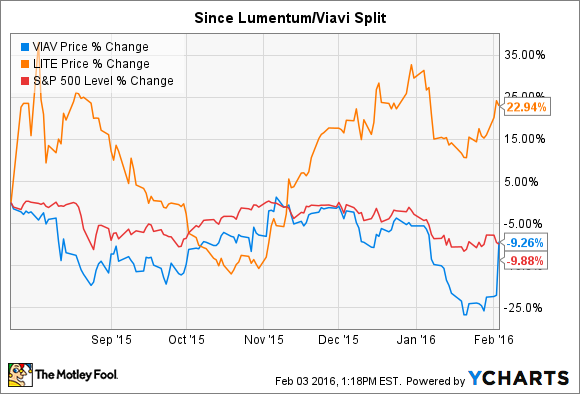 Bottom line, both Viavi and Lumentum are dealing with relatively slow growth at present and that could continue for some time.